As Easter weekend rolls around, many Sunday dinner tables will feature some kind of lamb. Chops, roasts, perhaps even a stew or two. Rich meats generally pair well with full, tannic wines. Tannin in wine slices its way through fat, allowing us to taste the wine’s considerable flavor – which usually makes a nice complement to the rest of the table. One of these tannic wines that can easily pair with lamb is a wine we’ve featured here before – Sagrantino di Montefalco from the Italian province of Umbria. Umbria, the “green heart of Italy,” is the only province in the country without any kind of coastline. Cultivation of the Sagrantino grape in Umbria can be traced to the town of Montefalco in 1549, although vineyards in that area date back as far as 1088. The name of the grape comes from the Latin “sacer,” meaning “sacred” – referring to the concentrated raisin wine produced by monks in this area both for religious rituals. A “regular” version of this wine was consumed in mass quantities by the locals during religious feasts and festivals like Easter and Christmas. Umbria is known traditionally for white wines. A combination of demand for those whites and the relative low yields of Sagrantino vines pushed much of the native red varietal out of the local vineyards during the 1960’s and 70’s, almost wiping it out completely. In 1979, a few wine producers sought and received a “classified status” for Sagrantino, which allowed broader cultivation. The status was granted in 1992. From that time, the acreage of Sagrantino vineyards has quadrupled. If you’re in the “I drink red wine because it’s good for my health” camp, you’ve found your wine. Sagrantino’s claim to fame is that it has the highest concentration of polyphenols of any grape varietal in the world. Polyphenols are the chemical compounds found in red wine (sometimes called resveratrol) that help the body protect itself from cellular damage. Speaking of tasting, these are frickin’ enormous wines. I considered Barolo and Barbaresco to be the “big Italians” until I tried Amarone – the super-concentrated wine made from partially dried grapes in Valpolicella. Move over, bambini. Sagrantino are inky black in color, highly tannic, and very high in alcohol. Mancy clock in around 15.5%. So, if you’re trying them – decant, decant, decant! (And assign a designated driver if you’re not at home.) Get the wine into a decanter a minimum of 90 minutes before you start your meal or else you’re going to end up with the wine equivalent of a mouthful of coffee. You can easily open it at lunch to serve it with dinner. After getting a couple of samples of this wine, the Sweet Partner in Crime and I decided to get into a lamb-making mood and grill some loin chops. 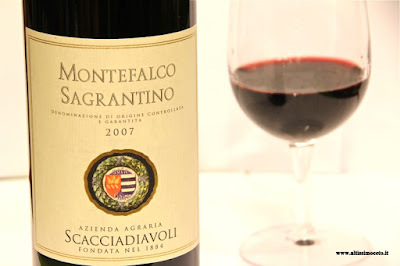 We had two bottles to try: the Antonelli San Marco 2009 Sagrantino di Montefalco (~$33) and the Scacciadiavoli 2008 Sagrantino di Montefalco (~$40). I opened both of them about three hours before dinner. Even that amount of time was inadequate for either of those wines to open. I had to do a speed decant on both of them – which, for me, means emptying the contents into a decanter and then immediately pouring it back into the bottle through a funnel. Probably not how a sommelier would do it, but hey...we’re low-tech around here. The Scacciadiavoli (which translates awesomely from Italian as “Devil Hunter” had a nose of roasted meats, cherries, and leather. The body had, expectedly, some very powerful tannins alongside some plummy fruit and spice. The finish continues for quite some time as the tannin gradually dried my tongue. As powerful as it was, it’s nicely balanced. The Antonelli was a somewhat different experience. This wine’s fruit opened much more quickly. The fruits were rich and full. The sensation was almost as if the fruit was “kissing me back” on the back of my lips with lots of licorice and blackberry flavors. There was a distinct undertone of oak to this wine which wasn’t there as strongly in the Scacciadiavoli. I thought this one wasn’t quite as well balanced, either. It was more approachable initially, and better to drink on its own. With the lamb chops, The Scacciadiavoli was the superior wine. The wine’s structure made it a better match with the chops’ flavor, I thought. As the more restrained wine initially, I thought its flavors developed more interestingly alongside the meal. We finished a glass of each and then recorked both bottles for later. We overbought on the loin chops but I went ahead and grilled them all. The leftovers ended up in a couple of lamb-and-mushroom melts a couple of days later. When we reopened the wines, both of them were still very drinkable. The Scacciadiavoli’s tannins had mellowed quite a bit, and it continued to be an excellent food wine. The Antonelli’s fruit calmed down a bit, but the overall experience was much more nondescript. If you’re cooking a big Italian themed meal this weekend and you want an elegant wine alongside – especially if you’ve got folks coming over who enjoy big wines – then this might be an interesting option. I love a wine with a good story. As you all know, I’m a big fan of bubbles. But I’ve never quite figured out what to do with Prosecco. 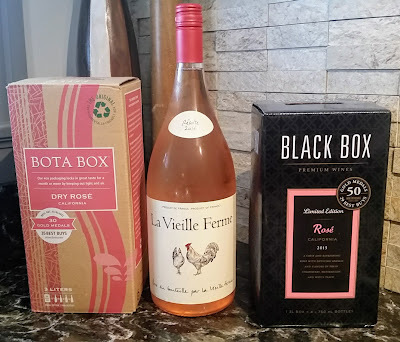 I can usually find it for about the same price as other decent, entry-level sparkling wines like Cava or some of the less-expensive American producers, like Gruet or Domaine St. Michelle. When I’m snagging a bottle to go with a meal, I rarely gravitate towards Prosecco on my own, but I’ll certainly try one if it shows up at the door. When a bottle of Carpenè Malvolti 1868 Prosecco di Conegliano-Valdobbiadene DOCG Extra Dry appeared, I was quite pleased. I’d given good marks to the Bisol “Crede” Prosecco a couple of months ago, and I hoped that this one would be of similar quality. As I pointed out when I wrote about the Crede, if you see the regional classification of “Valdobbiadene DOCG” on the side of a bottle of Prosecco, you’re probably looking at a pretty decent bottle. What I didn’t realize when I opened the package was that I was holding an interesting little piece of history. Antonio Carpenè, the man whose name is borne by the bottle, sounds like one fascinating dude. He was a pioneer in Italy of scientific winemaking. Armed with a Chemistry degree from the University of Pavia, he turned away from a professorship at the University of Bologna to found the first modern winery, Carpene-Malvolti, in the Veneto in 1868 (hence the wine’s name) as well as founding the Istituto Conegliano, which is now the largest technical winemaking school in the world. Now, one might suggest that he was a little too deeply ingrained with science. His son was named “Rubidium” and his daughter was named Etile, which is the Italian spelling of “Ethyl.” He was going to name his second daughter “Oenocyanin” – after the pigment in grape skins, and I can imagine the…um…conversation that followed. The daughter ended up being named “Mary,” who eventually carried on the family tradition by naming her first son “Iridium.” Takes all kinds. In any case, in the 1930’s, Carpene’s sone, Antonio Carpene, Jr. decided to apply a new method of wine carbonation to Prosecco. This method, called Metodo Italiano or the “Charmat Method,” is a less expensive, less time-consuming carbonation method than the tried-and-true method Champenoise. In the Charmat Method, rather than being carbonated in bottles, the wine undergoes this secondary fermentation in steel tanks, which are sometimes coated in enamel. The wine is bottled under pressure in a continuous process. The grape varieties like Glera used in Prosecco respond positively to this method, maintaining their flavor characteristic much more firmly. would be a good match for a fish dish. Since the Sweet Partner in Crime and I had a meal of slow-roasted salmon filets with a horseradish-yogurt sauce and some roasted balsamic potatoes in the queue, we decided to throw this in the fridge and hope for the best with those somewhat difficult to pair flavors. My first impression was that the flavor profile in general was much richer than a “typical” Prosecco. The nose is floral with a hint of yeast and caramel. I found big peachy-pear flavors on the front end which led me to expect a Moscato-style sweetness. Instead, the palate is soft and quite dry. The carbonation is pleasantly sharp, finishing cleanly with a long, pleasant peach finish. Quite pleasant to enjoy on its own. AFter enjoying this wine with our meal, I imagine this wine could be a Swiss Army knife of pairings for a Prosecco lover. It has enough carbonation to clean the palate of a creamy sauce like the one we used, while it still had enough flavor to balance the starch and cut through the oil in the fish. The price of the Valdobbiadene area wines tends to be a bit higher, but I thought it was every bit the equal to the Crede, which I previously reviewed – but at $19, it’s several dollars a bottle less. If you’re looking to explore some of those wines, this would be a nice entry into higher-end Prosecco. Is it a bit of a reach for an everyday sparkler? Probably, but I think you’ll enjoy the flavors within, whatever or whomever you have it with.